Google has released a brand new YouTube app which lets you watch and share videos offline. The app, called YouTube Go, has been made primarily with Indian users in mind, and is launching in the South Asian country first. As it is everywhere around the world, YouTube is massively popular in India. The problem is that under-powered phones, slow connection speeds, and/or restrictive data caps Why Do Data Caps Exist and How Can You Bypass Them? Why Do Data Caps Exist and How Can You Bypass Them? ISP and mobile data caps are the bane of everyday Internet users. Why do these exist? Are there any ways you can get around them? Here's what we know. Read More can make actually using YouTube a pain in the posterior. Which is where YouTube Go comes in. 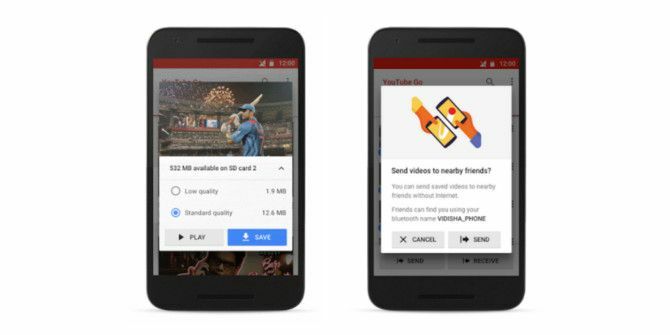 In a post on the Official YouTube Blog, Johanna Wright, Vice President of Product Management, describes YouTube Go as “a brand new YouTube app that’s faster, more relevant, and more affordable, with innovative new features”. Wright further explains that it’s been “built from scratch to bring YouTube to the next generation of viewers”. So what does YouTube Go actually do? YouTube Go is designed to be offline first, and not being connected to the Internet is the default setting. To make this possible, YouTube Go lets you save videos to watch offline, and choose the amount of data you want to spend on it (by changing the resolution). You can also share videos with other people 7 Secrets to Posting Viral Videos Everyone Will Share 7 Secrets to Posting Viral Videos Everyone Will Share For people trying to get their carefully crafted video to spread across the Internet, understanding why people choose to share some things and not others has become a bit of a science. Read More via Bluetooth, saving more data. And preview videos using a minimal amount of data so you’ll quickly know whether it’s worthy content. Finally, the homescreen has been changed to better reflect popular and trending content in your local area. Thus saving users time sifting through uninteresting videos. Indian YouTube users can sign up to test YouTube Go right now, with a full launch expected at the start of 2017. If it then proves both popular and useful expect it to be launched in other countries facing similar issues. Will you be signing up to try YouTube Go? Do you hope Google releases it outside of India sooner rather than later? Please let us know in the comments below! Explore more about: Google, Online Video, YouTube.